The snow is piling up at Mountain Dell. Today's continued snowfall and steady winds are making for a tough task, but we are working the snow to produce the best track moving forward. Rough skiing today, but we will set corduroy and perhaps classic track on Friday morning. Come join in on our celebration of winter's return! 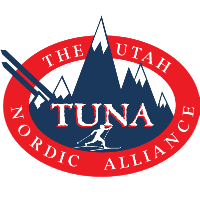 Support Utah Nordic Alliance by shopping at AmazonSmile. When you shop at AmazonSmile, Amazon will donate to Utah Nordic Alliance. Support us every time you shop.